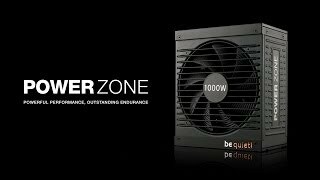 POWER ZONE | 850W silent performance Power supplies from be quiet! Power Zone 850W provides the winning combination of superior performance, rock-solid stability, and advanced cooling. Whether you are assembling a high-power PC or multi-GPU gaming system, you are certain to benefit from the outstanding features. Power Zone 850W delivers a best-in-class blend of performance and quality for a reasonable price. With the massive 12V rail design the Power Zone can deliver up to 840W on the +12V rail, respectively 98.8% of the total power. This feature makes Power Zone the perfect PSU for overclocking your CPU and GPU. Only the best components are utilized in Power Zone 850W. That is why we have used only high quality 105°C-rated capacitors on both AC and DC side for maximum performance, high reliability and longer PSU life under high load. You are already using a be quiet! power supply and want to upgrade your system with a new POWER ZONE | 850W ? Check here which cables are compatible and don't need to be replaced.